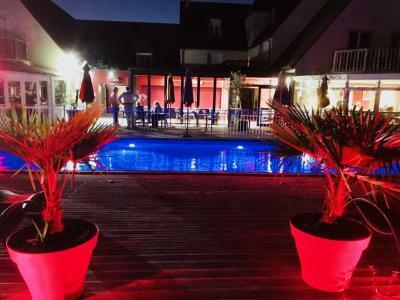 Lock in a great price for Les Terrasses de Saumur - Logis - Hôtel Restaurant & Spa - rated 8.5 by recent guests. 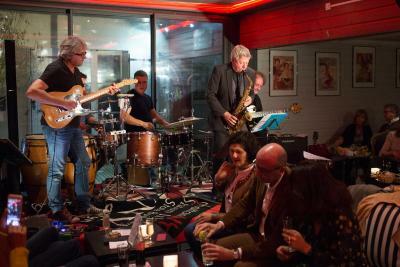 The welcome, the situation and the garden room. Our dog liked the walks nearby. The staff were friendly and helpful. The beds were comfortable. We stayed in an apartment which was very nice and comfortable. The pool was really nice as was the restaurant food and service. Fantastic quiet location. Lovely pool and views. Great to have kitchenette so we could have a simple meal after a long journey. I loved the upstairs bedroom. Spacious and comfortable. The location was good for the wine caves on one side of town. But the walk into the town was over 40 mins. Room was comfy and clean with small balcony. Great view from pool area. The staff were super friendly, loved the decor, bed comfortable and the pool and views were fabulous! Lovely scenery, peaceful & comfy beds! Would love to go back. A quirky place! The hotel’s restaurant serves quality, bistronomic cuisine based on local produce. Free outdoor parking is available on site. 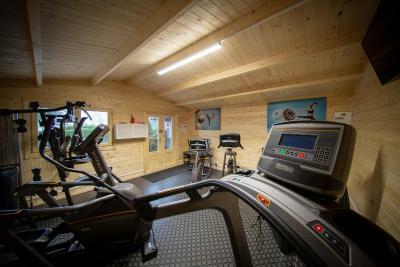 The property is located 1.2 miles from Le Cadre Noir, the National Horse Riding School and 1.9 miles from Saumur Golf. The Bouvet Ladubay and Langlois Château wine caves where guests can have Saumur sparkling wines are situated 0.6 miles from the property. 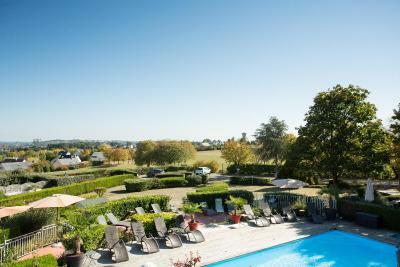 Les Terrasses de Saumur - Logis - Hôtel Restaurant & Spa has been welcoming Booking.com guests since 10 Dec 2009. When would you like to stay at Les Terrasses de Saumur - Logis - Hôtel Restaurant & Spa? 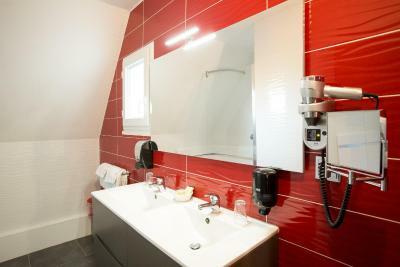 Free Wi-Fi access, a TV with Canal+ channels and a kettle for making hot drinks feature in this room. Twin beds are available upon request at the time of booking. A flat-screen TV and a kettle for making hot drinks are provided in this larger room. Canal + and satellite channels are provided. A flat-screen TV and a kettle for making hot drinks are provided in this room. Please note that a 3 single bed configuration is possible upon request and is subject to availability. This room offers a kettle for hot drinks and a flat-screen TV. 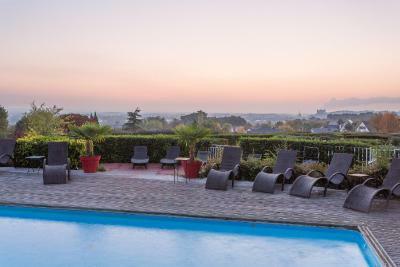 This suite offers a balcony with a panoramic view of Saumur. 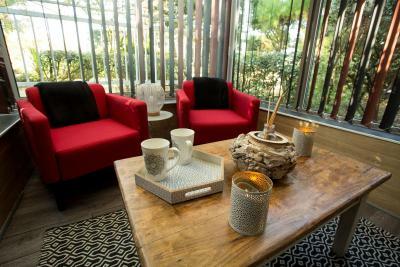 A seating area and a kettle for making hot drinks feature in this spacious suite. 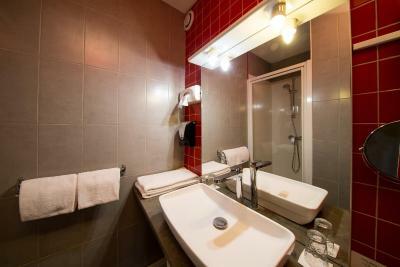 A spa bath is provided in the bathroom and a flat-screen TV with satellite channels and Canal + is also available. Guests can enjoy free WiFi in the suite. 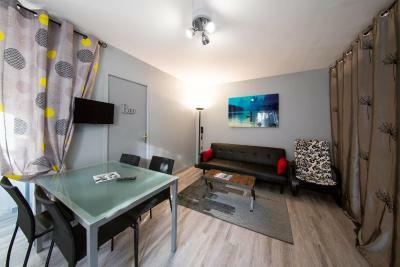 This spacious and independent, self-catering studio apartment features a seating area, an outdoor wooden terrace and a kitchenette. 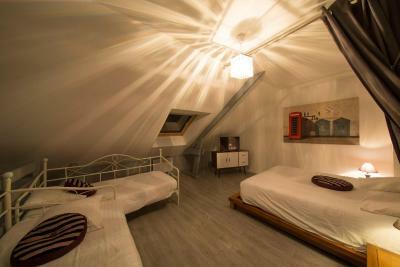 Free WiFi and a flat-screen TV with Canal +, satellite channels and beIN Sport are provided. You are kindly asked to clean the kitchen before departure or an extra fee may be charged. Room cleaning is not included during the stay unless it has been asked with an extra cost. Please note that baby cots are available with an extra cost. 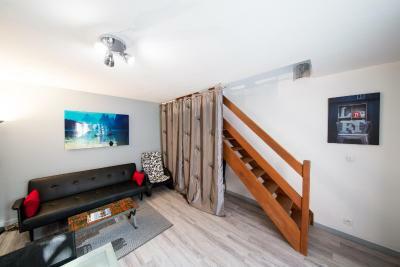 This duplex apartment offers a fully equipped kitchenette, a private terrace and free WiFi. A seating area and 2 flat-screen TVs with satellite channels are provided. 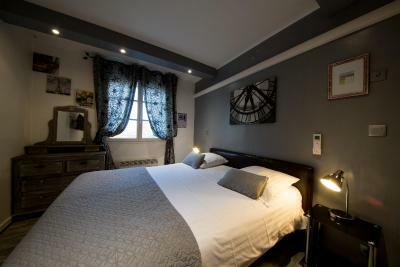 The bedroom is located on the upper floor and has either 2 double beds or 1 double bed and 2 single beds, according to availability. Guests are required to clean the kitchen area before departure. Failure to do so will incur extra fees. Daily cleaning is not included but can be requested for a fee. 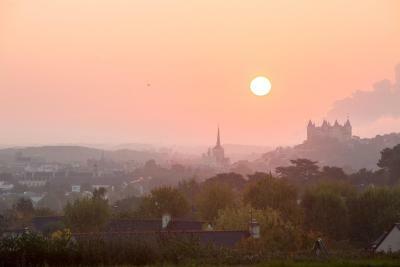 On the heights, a residential site with the panorama and the sight exceptional on Saumur and its castle. 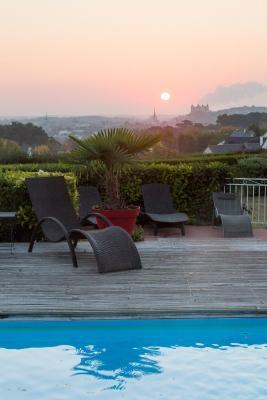 What our restaurant offers more: an exceptional sight on the castle of Saumur and an external exotic wood terrace with palm trees. House rules Les Terrasses de Saumur - Logis - Hôtel Restaurant & Spa takes special requests - add in the next step! 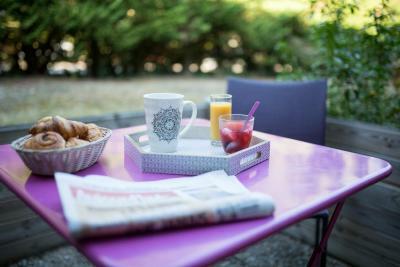 Les Terrasses de Saumur - Logis - Hôtel Restaurant &amp; Spa accepts these cards and reserves the right to temporarily hold an amount prior to arrival. 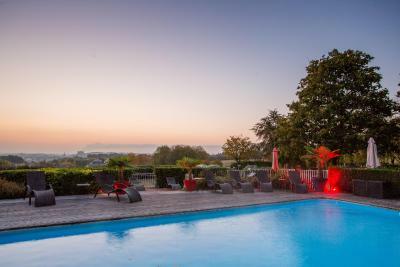 Les Terrasses de Saumur - Logis - Hôtel Restaurant & Spa accepts these cards and reserves the right to temporarily hold an amount prior to arrival. If you plan to arrive after 22:00, please contact the hotel in advance. Contact details can be found on the booking confirmation. The outdoor swimming pool is open from mid-April to end of October. Please note that cleaning products are not provided. 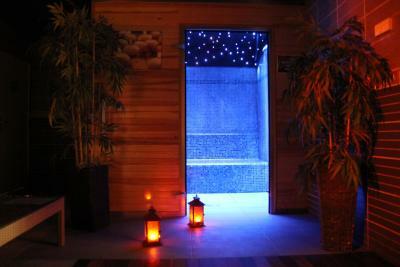 Please note that the spa and wellness centre, including the hammam, are available for an additional charge. 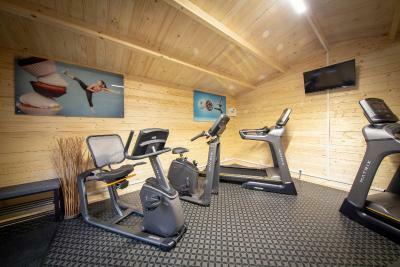 Bike rental is subject to availability and has to be booked in advance. The decor, but it did not detract from the pleasure to be there and we don't all have the same taste! The only toilet was downstairs. The breakfast room was too small and badly laid out. On our last day we waited 20 minutes to be seated. Felt the 'rules' re kitchen were a bit draconian. The children's play area was very tired, with plastic swing seats broken and the structure swayed considerably when the kids were swinging on it. We didn't stay long as I wasn't sure it was entirely safe. 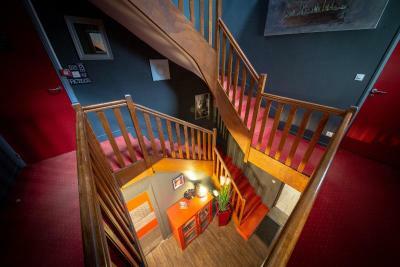 Duplex apartments were perfect for us. With a separate living/kitchen area and outside patio. The swimming pool was very nice, and warm. We had dinner at the restaurant one night, which was very good! The view of the château from the hotel was beautiful. Left waiting a very long time for menu and drinks before dinner. Table was booked for 4. Long wait and pretty much ignored by staff. After the long wait, when they took our order for starters and mains they also asked what we wanted for dessert. Yet at that stage of the meal! Ridiculous. Fabulous pool and views. Quirky bar area. Outdoor seating very comfortable and relaxing. Swimming pool difficult to get in, Steps not easy, could do with a handrail! Menu limited and not changed for whole season! Maybe the pool could be cleaned and opened before 8am! Evening menu didn't change in the 3 nights we stayed. Some plain child friendly food alternatives would have helped picky child eaters.